In this tutorial, we'll explain how to work with versions in Jira Software. 10 minute read. Complete over 2 weeks or more. You have the Administer Projects permission for all projects on your Scrum or Kanban board. See Managing project permissions for more info. What is a version in Jira Software? 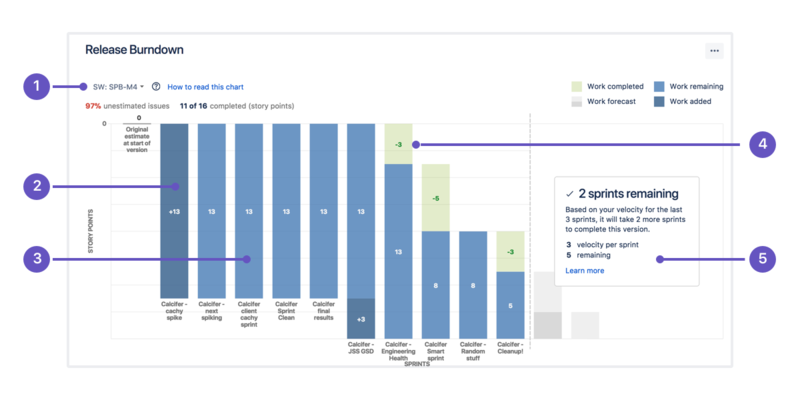 In Jira Software, versions represent points-in-time for a project. They help you organize your work by giving you milestones to aim for. 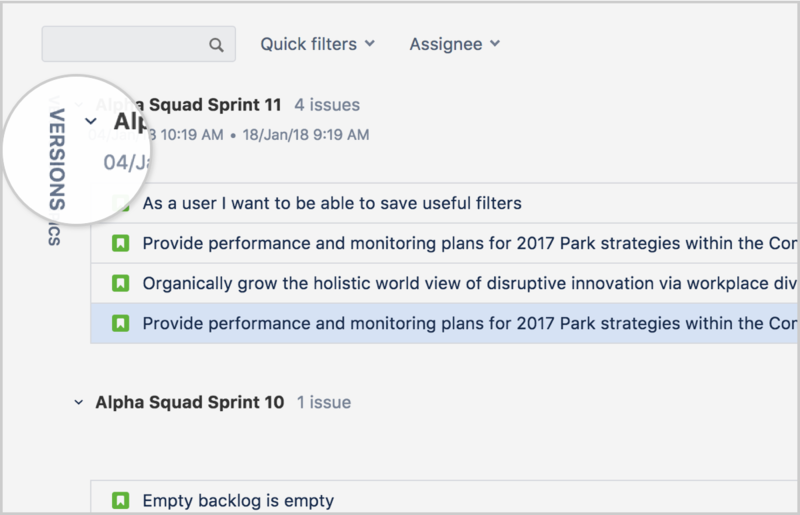 You can assign issues in your project to a specific version, and organize your sprints around completing work in that version. In the project menu, click on Releases. Select the Version name text box, enter a name, and click Add. Version names are typically numeric, for example, 1.0 or 2.1.1. You could also consider using an internal codename. How many versions should I create? You can create as many as you think is necessary. For example, you might create several versions, to plan ahead. Or you might just have one or two versions for now. Once you create a version, the Affects version and Fix version fields will become available on your issues. Navigate to the project backlog. Open the Versions panel on the left. Drag an issue to the version you want to add it to. Open the issue you want to add to a version. Find the Fix version/s field, and enter the version you want to add the issue to. What's the difference between Fix version and Affects version? Affects version is the version in which a bug or problem was found. Although it can be useful for tracking problems, it isn't used very often in Jira. Fix version is the version where you plan on releasing a feature or bugfix to customers. This field is used for release planning, monitoring progress and velocity, and is used widely in reporting. This is most likely the field you want. Jira Software gives you many tools you can use to check the progress of a version. We'll discuss a few of them here. The release hub provides a place for you to manage all your releases. It also gives you information on the status of your releases, and a breakdown of the number of issues in each version. In the project menu, select Releases. Quick filters: Focus on specific versions by filtering out the ones you aren't interested in. Version list: Drag and drop versions to reorder them. Status: Versions can have one of three statuses: Unreleased, Released, or Archived. Progress: This shows how many issues have been assigned to the version, and how many are in each status. Want more information to help you monitor your releases? If you integrate Jira Software with your Bitbucket repository, you'll also see development information here relating to your commits, branches, and pull requests. The release burndown chart shows how much work has been completed, and the total work remaining. Burndown charts are used to predict your team's likelihood of completing their work in the time available. They're also great for keeping the team aware of any scope creep that occurs. Note that to use the release burndown chart, you'll need to estimate your issues. For more information, check out our guide on burndown charts. In the project menu, select Reports. Release menu: Select which release to view data for. Work added: The dark blue segment shows the amount of work added to the release in each sprint. In this example, work is measured in story points. Work remaining: The light blue segment shows the amount of work remaining in the release. Work completed: The green segment represents how much work is completed for the release in each sprint. Projected completion: The report projects how many sprints it will take to complete the release, based on the team's velocity. For more in-depth information, check out our release burndown chart documentation. It's time to turn your team's hard work into a software release. By this stage, you should be confident that your version is ready to be released — issues are complete, code is checked in, reviewed, and merged, builds are passing, etc. 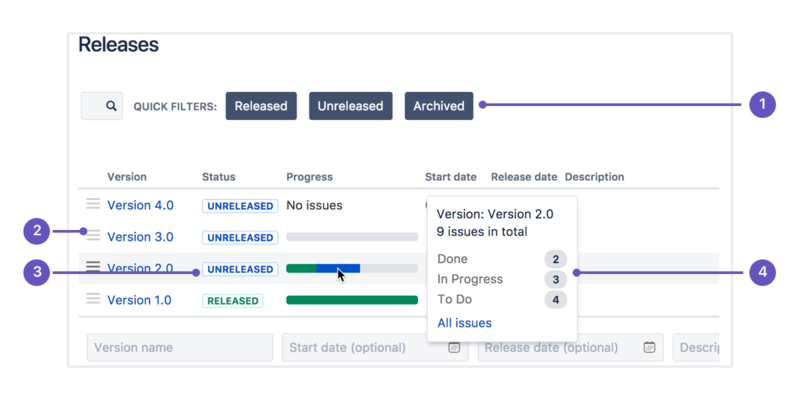 To deploy a release, you would typically release the version in Jira Software, build the release, then deploy the release to the required environment. For the version you want to release, select Actions ( ) > Release. On Kanban boards, you can also release all issues in the Done column as a new version directly from the board itself. For more detailed information on working with versions in Jira Software, check out our versions documentation. Have questions? Ask the Atlassian Community.